Zanshin is trying to provide a software support for the "Getting things done" approach of David Allen. It integrates very well in the KDE environment using Akonadi as a main back-end to store you personal information, providing strong integration with KMail or KOrganizer. Zanshin is targeting tasks management, but in order to provide a note management aspect, Renku, a standalone application is born along the development process. Both are complementary and help the user to keep track of his todo's activities. Context is a meta-data concept. Since todos/tasks can be related, for instance, to a specific project, it would be nice to express this semantic link : that's where Context rises up. You, as a user, will be able to link any kind of context name to a todo, helping you to organize and give the semantic you want them to have. Akonadi Backend : The context concept is stored into akonadi through the Akonadi Tag. An item holds a list of Tag that have a name and can be from different types. As a convention, a tag with the custom type "zanshin-context" would be zanshin related, its name, that will be displayed to the user, will depend on what the user as set. As a user I want to filter tasks by context. 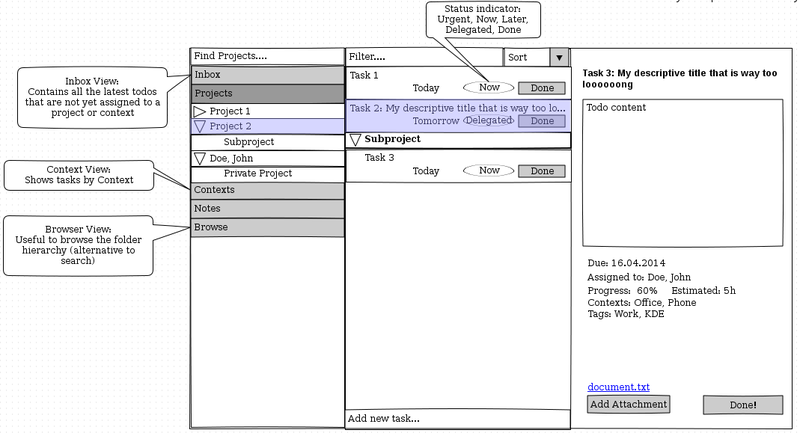 As a user I want to delegate a task to another user. As a user I want to monitor progress of a delegated task (The progress updates are handled by iTip already). 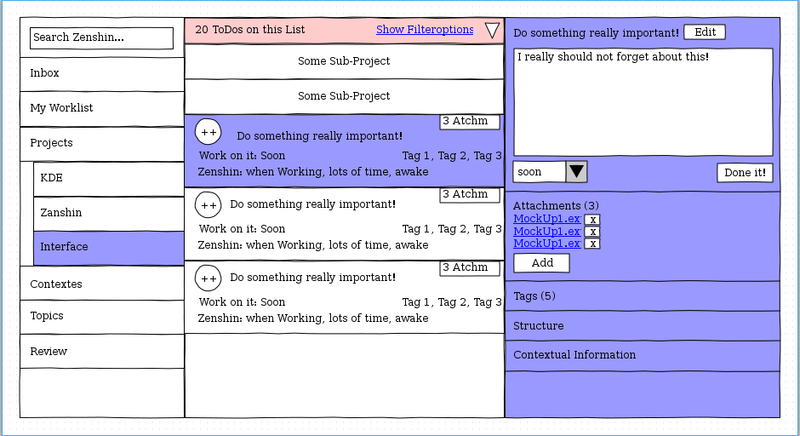 As a user I want to see tasks that I assigned to someone but have a visual distinction that I don't have to act on them directly. As a user I want to maintain a list of visible although not necessarily selected folders, so I can quickly enabled the folders as required. As a user I want to search for new folders to enable, that will then appear in my folder list. As a user I want to remove folders from my currently visible list. As a user I want to see to whom a shared folder belongs. Draft UI Mockups, not final. This page was last modified on 2 April 2016, at 11:55. Content is available under Creative Commons License SA 4.0 unless otherwise noted.